I WOULD BE HUNTING with keen hunter and friend Tony Pizzata and where better than the famed Strathburn Station. It was a rainy Monday morning in Sydney as I left for the long journey north. With a raging temperature, nothing was going to stop me. I ventured over 3000km in three days picking Tony up on the way through Cairns. We arrived at Musgrave Roadhouse late on Wednesday afternoon for a quick bite and to refuel. By this stage, I was running on adrenalin and the butterflies in my stomach were lifting me out of the seat as we turned down the Strathburn Station driveway. We were greeted by Alisdair, who is the Manager and Guide on the place. We talked about our hunting plans and I went to bed thinking about the coming days. I woke to a pig meandering around the house and no sooner, I had dropped my first good solid boar. Alisdair told us that we would need to take it easy to acclimatise to the heat. We packed a small lunch, plenty of water and set off into unknown territory. Alisdair turned the Troopy off and pointed at boar after boar moving across the road. We travelled into the property further and Alisdair taught us a few things about the land in case we ever got lost. We stalked up to a swamp to move in on the resident boar's snorkelling around the lilies. Tony set the camera up as I prepared for the shot. I pulled the trigger and the boar jumped like crazy. I pulled a second shot and missed, out of pure excitement. The third load stopped him in his tracks as Alisdair and I walked out into the croc infested water to cart the monster back. My eyes were popping out of my head, but I had full faith in his judgement. We went to another swamp along the way, where Alisdair had seen a few the other morning. We arrived and I reckon I counted eighty pigs with twenty tipping the one hundred kilo mark. I started a stalk and the wind suddenly changed, so the pigs retreated to the scrub. Tony grabbed a bit of footage, but I was still mesmerized in the numbers and size of them all. On the walk back to the Troopy, I shot a reputable tusky boar as he was having a quiet nap. Heading back to camp, I shot another good boar off the track. We travelled past the first swamp and there was another mob with two big boars feeding in the lilies. I set up for the shot and pulled the trigger and earned a Weatherby eyebrow in the meantime. While I was bleeding like crazy, I watched as the mob scattered into the scrub line. On the second morning, I dropped a healthy young boar and returned to finish off my coffee and corn flakes. We then packed lunch, drinks and set out for more hunting. 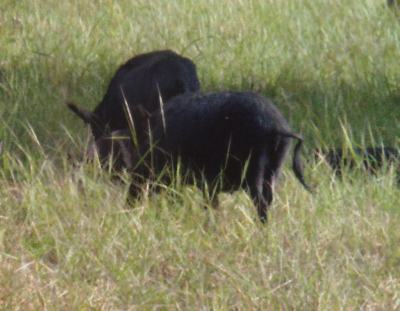 By lunch, I had shot two more boars from a dried out creek bed and both had reputable tusks. We pulled up at another spot where the the blokes catching bulls on the "outside" country had seen a few and there was a cranky boar rooting up. I cleaned him up and a big spotty boar erupted from the grass. I thought this was the biggest pig I would ever see, but Alisdair told me he'd get me a bigger one. We took a few photos and Tony sent me to the car to get batteries for the camera. On return to the car, there was a mob of around twenty five pigs that were very interested in me. There were no boars present, so I shooed them off. We went to another spot and walked the creek beds and Tony wanted a shot, so I filmed. Out of a dead tree root charged this boar at lightning speed and Tony put him down with one shot. We decided to head back to camp, only to be interrupted by another boar and a couple of sows. I set the shot for Tony and he dropped another good tusker. On the third morning, I hit another good boar that was feeding on a dead cow. I spotted his mate in the distance, so I set off on foot and dropped them fifty metres from each other. 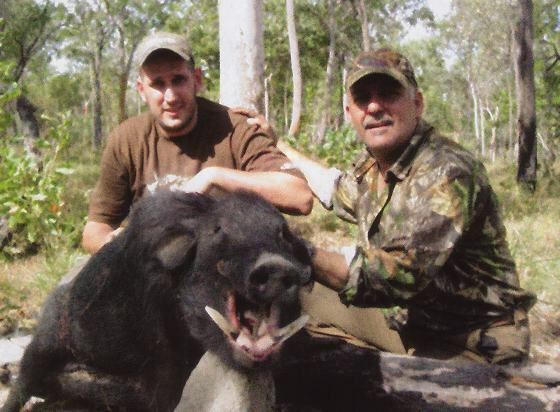 We headed off for another cracker of a day and Tony bagged a good lone boar on a small swamp. I was passing up any boars smaller than what I had al-ready shot, however Tony captured some great footage. Alisdair was telling me a story of a bow hunter that lost a good boar nearby, so we stopped and set off on foot. Before Tony could set up the camera, Alisdair pointed his finger at a humongous boar, so I shot him dead in his tracks. He was old, sported thick armour shoulder pads and had a set of hooks that hunters dream about. I was wrapped and had a smile from ear to ear as Tony caped him out. 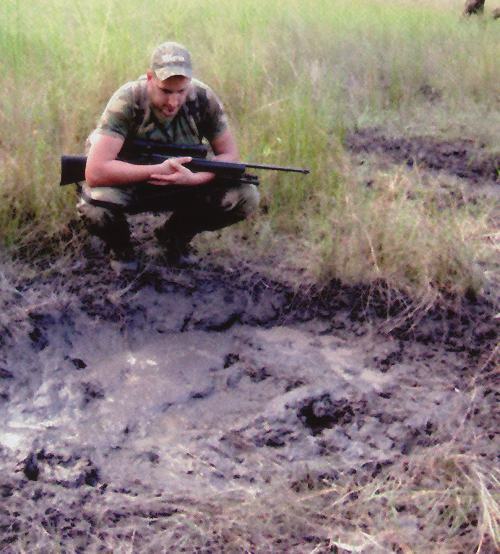 My last morning hunt was amazing as I grassed an eighty kilo beast. 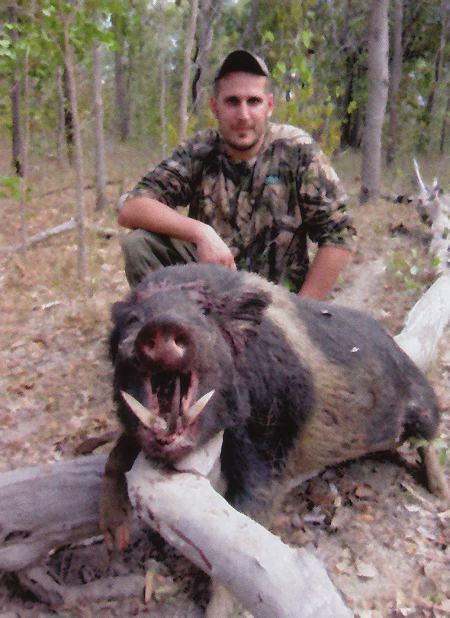 We shot a few good boars during the day and spent a few hours casting lures only to have no success. Alisdair took us to a place he had never been to, so we drove for around forty minutes to a paper bark swamp. The goose bumps rose on my arms every time I thought of this place as it was eerie. We walked for ten minutes and I could hear something in the trees. I set up a spot and waited for a boar to come out. At his own pace, the razorback trotted out with a snout full of mud and it was hard to see if he was a big boar or a massive sow. I waited for Tony's commands and I then pulled the trigger. Hitting him in the back bone, he took off like a jet on a runway as I pulled the second shot off to hit the tree five metres in front of me. By now he was in cover as I took off after him. Stalking him, I placed the third shot on his heart region and ran toward him. Full of excitement, it was hard to tell Tony and Alisdair that it was a sow, but after inspection, one of the best sets of tusks I had ever seen was right in front of me. Tony helped cape this one out and then we walked back to the Troopy. We set off for Cairns the next morning and I dropped Tony off for his flight back to Sydney. Exploring and hunting over Strathburn was an absolute thrill and I recommend the visit to any keen hunters out there as there is no shortage of good solid tusky boars.